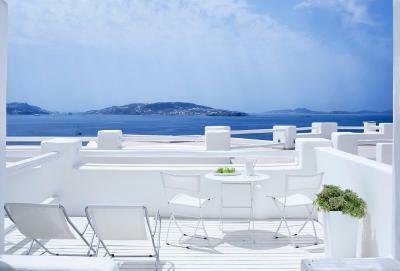 Lock in a great price for Rocabella Mykonos Hotel – rated 9.6 by recent guests! Wonderful hotel that far exceeded our expectations. The staff was so helpful and friendly that we took photos with them to remember them! The facilities are so amazing that you'd never need to leave the property, but if you do, their shuttles (and shuttle drivers) are prompt and easy to use. They asked us to use What'sApp to call a shuttle to pick us up from downtown and it was genius because they answered the text promptly and the drivers showed up exactly on time! I can't say enough about this hotel and the staff. You'll be thrilled to stay here. Margarita and stavros were amazing !! Everything about the place more than exceeded expectations. I would suggest it to anyone who has been to Greece and more so for first time . They plan and map out your whole time there and leaving you not wanting for anything. Hope to go back soon !!! Every staff members were very friendly and professional, and the hotel was so beautiful and well designed. Their service was top notch as well. We had such wonderful time and relaxing time at Rocabella. I’ve travelled extensively over the past 30+ years for work and for vacation. I don’t think I’ve ever experienced a welcome like we received at Rocabella! The staff are warm and enthusiastic and seem to really enjoy their profession. The hotel is beautiful and clean. 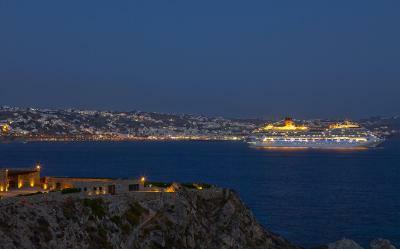 Excellent location near town but out of the way of cruise ship crowds etc. this is a place that understands hospitality and goes above and beyond to delight guests. First of all, I loved the staff. Margarita and Maria were the absolute best. They were extremely useful to guide us with all of the many things to do on Mykonos, and their disposition was 10/10, at every time of the day. The hotel is beautiful. From the parking, to the design of the rooms, to the facilities, to the reception. Everything was exceptional. Giorgios, the transfer driver on the hotel, was really kind and nicely euphoric. The shuttle bus service is really useful since the location of the hotel is somewhat far from the town. The balcony view at our room was lit of this word. The bathroom is very comfortable. The breakfast was delicious. Everything was nearly-perfect. Location, view, style, intimate vibe, personal service...from the moment we arrived we knew we were in for a great experience. The welcoming staff was some of the best we have ever experienced and we are very seasoned travelers. Even during the off season, the entire staff was at or disposal and felt like good friends from first meeting. 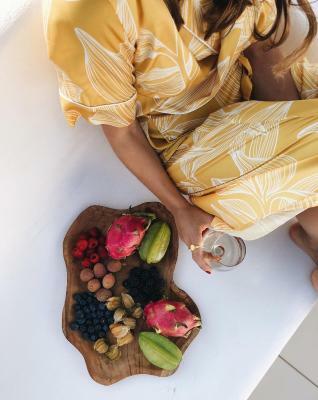 From the hourly shuttle service to town, the complimentary breakfast, the room and amenities (jacuzzi terrace with amazing view room 112), and basically anything we needed suggestions on or help with, Rocabella nailed it! Alan, Maria, Margarita, George and the rest of the crew will be greatly missed. We will be back to enjoy the tremendous renovations they have in store for this already award-worthy property!! 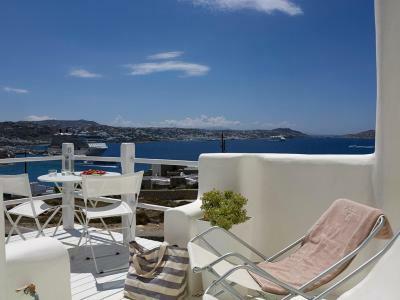 Rocabella Mykonos Hotel This rating is a reflection of how the property compares to the industry standard when it comes to price, facilities and services available. It's based on a self-evaluation by the property. Use this rating to help choose your stay! One of our top picks in Agios Stefanos – and a guest favorite. 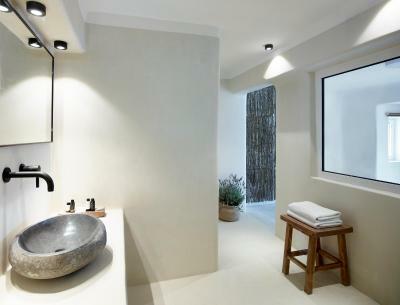 Rocabella Mykonos Hotel is located within walking distance of the sandy Agios Stefanos beach. It features a pool, fine dining, stylish rooms and a spa. 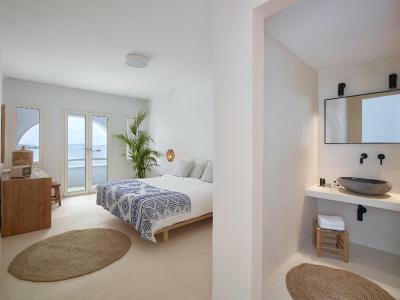 The rooms of Rocabella feature free Internet access and a furnished sea-view balcony or terrace. They are fitted with a satellite LCD TV and a safe. Some rooms also include an outdoor plunge pool. A pillow menu is also available. The state-of-the-art spa is equipped with a sauna and a gym. It also provides facial and beauty treatments, and massages. Greek breakfast is served daily in the dining area. The hotel’s restaurant prepares gourmet cuisine in a romantic poolside setting. 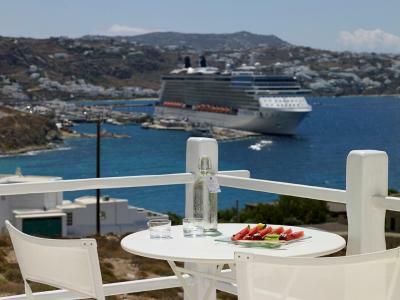 Guests can also enjoy a drink at the pool bar with views over the neighboring Tinos and Dilos islands. Personalized concierge services are available for guests, as well as a turn-down service with essential oils. Mykonos Airport is 3.1 mi away from Rocabella. The picturesque town of Mykonos is less than a 10-minute drive away. Free on-site parking is available. This property also has one of the top-rated locations in Agios Stefanos! Guests are happier about it compared to other properties in the area. This property is also rated for the best value in Agios Stefanos! Guests are getting more for their money when compared to other properties in this city. 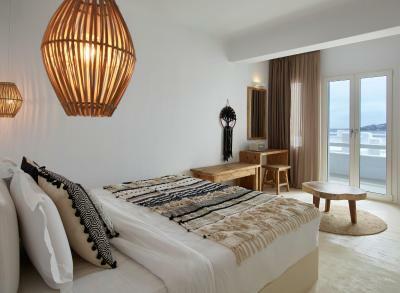 When would you like to stay at Rocabella Mykonos Hotel? 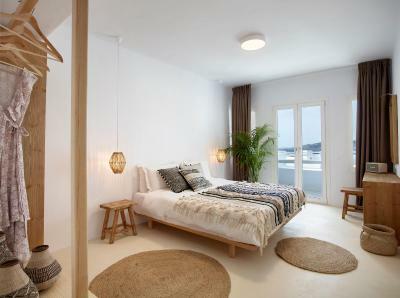 Offering Aegean Sea views, this air-conditioned room opens to a private balcony. It features a mini-bar and a flat-screen, satellite TV. Free WiFi is provided. Please note that this room can only accommodate 2 people. 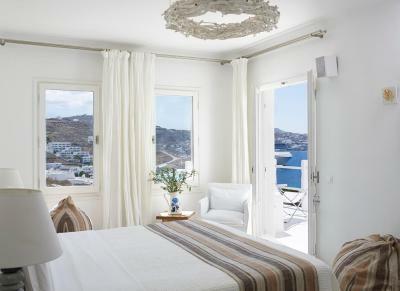 Offering Aegean Sea views, this air-conditioned deluxe room opens to a private balcony. It features a mini-bar and a flat-screen, satellite TV. Free WiFi is provided. 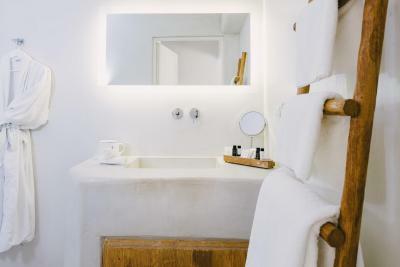 Fitted with an outdoor tub with hydromassage jets in its spacious and private balcony, this air-conditioned deluxe room comes with Aegean Sea views. It features Coco-Mat mattresses, a mini-bar and a flat-screen, satellite TV. Free WiFi is provided. Please note that the outdoor hydromassage is temperature-controlled and subject to weather conditions. In extreme weather conditions, guests may not be able to use the facility. 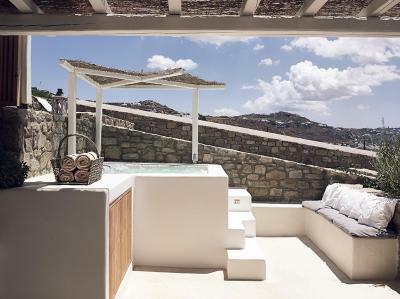 Offering an outdoor tub with hydromassage jets and unobstructed views of the Aegean Sea, Mykonos Town and Delos Island, this air-conditioned suite opens to a private, spacious balcony. It features a mini-bar and a flat-screen, satellite TV. Free WiFi is provided. Please note that the outdoor hydromassage is temperature-controlled (28 -32 Celsius degrees) and subject to weather conditions. Please note that each bedroom has a separate main entrance. Please note that the outdoor spa is temperature-controlled (28 -32 Celsius degrees) and subject to weather conditions. Please note that this room type has only one main entrance. Guests must pass through the main bedroom to go to the 2nd bedroom. 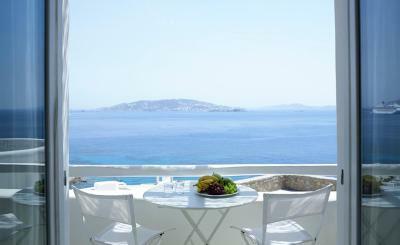 Dear guests, We would like to thank you for the interest you showed in Rocabella Mykonos Hotel. We promise that we will do our best to turn your vacations into an unforgettable stay, in case that you will finally honor us with your choice! We are always looking forward making each of your dreams come true so we would be more than happy to host you and meet you in person! 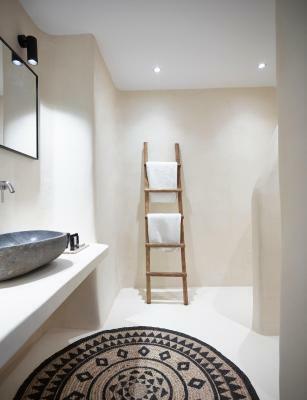 Rocabella Mykonos Hotel means barefoot elegance so join us and come closer to the authentic Greek hospitality! 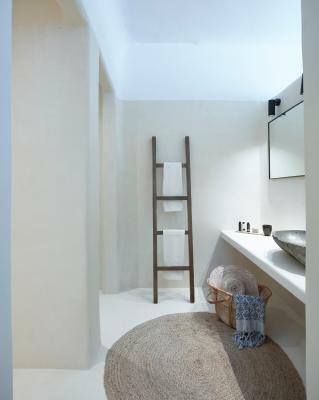 House Rules Rocabella Mykonos Hotel takes special requests – add in the next step! Rocabella Mykonos Hotel accepts these cards and reserves the right to temporarily hold an amount prior to arrival. Please note that Rocabella Mykonos Hotel participates in the Greek Breakfast Initiative by the Hellenic Chamber of Hotels. The private, outdoor hydromassage tubs are temperature-controlled (28 -32 Celsius degrees) and subject to weather conditions. Please note that the breakfast is based on seasonal products, and thus might slightly differ from the photos. Staying at Rocabella was absolutely fantastic and exceeded our already high expectations (it was recommended by friends who went on their honeymoon). It’s a modern, stunning property but the best part is the genuine care and attention to detail by the entire staff! This is hospitality at its finest — our arrival included a welcome drink, along with a personal consultation with Margareta, who went over a map of the entire island and listened to our plans and preferences to make personalized recommendations (and she was spot on! Fantastic dinners at Eva’s Garden and Avra, with all reservations arranged by the hotel). Margareta remembered our names and we were greeted warmly through our entire stay by her, as well as her colleagues Lia, Ioanna, the wonderful breakfast/pool bar staff, and the shuttle driver, George (more on him later). 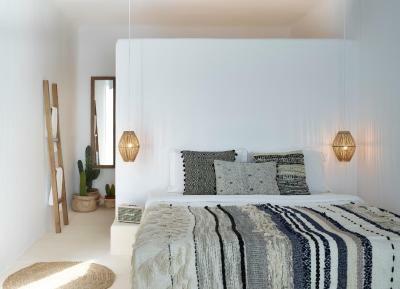 Our room was fresh and luxurious in the stylish/boho Rocabella style, with a gorgeous view of the Aegean. Here’s what impressed me most: the attention to detail. I noticed the entire hotel staff wiping down glass lanterns by the pool, fluffing cushions, arranging accessories...their pride and care for the property and their guests was exceptional. They noticed when we went to breakfast/left for the evening so that turndown service and housekeeping was completed without interrupting our schedule. 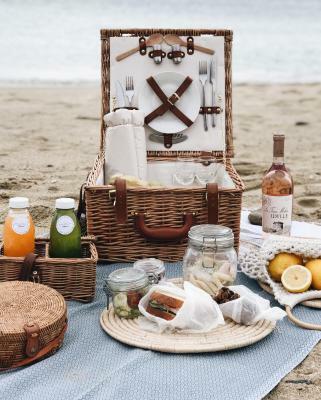 These are the little things that make a hotel stay truly memorable. And we must mention George, the shuttle driver, whose good cheer, conversation, and genuine friendliness was something we talked about for the rest of our trip. Rocabella is relaxing, romantic, a perfect location from which to explore Mykonos Town and the beaches, and a place we certainly hope to return. The unseasonable weather - cyclone Zorba (indirect impact). Everything we experienced. The staff were fantastic. The food was amazing. The view was beautiful. The room was very comfortable. The turn down service was special. The complementary shuttle to town extremely helpful. Loved our stay so much. 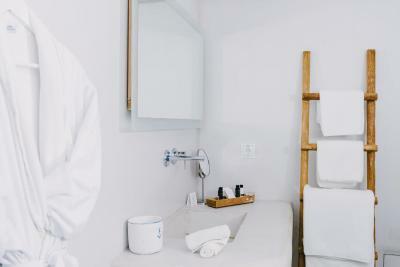 Best hotel in Mykonos. Amazing resort, amazing food, beautiful view, awesome room size, facilities and cleanliness. 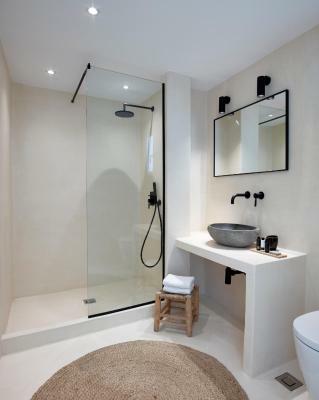 Loved the bathroom and shower!!! So close to town. Secluded enough but still close to everything. Convenient shuttle that takes you in and out of town. The staff went above and beyond, were all so friendly. Family feel, felt comfortable and at home even in a 5 star luxury resort. Truly one of the best stays on our 4 week honeymoon. Breakfast is amazing too! This hotel had met all of our expectations. Beds comfy, staff exceptional and restaurant fabulous. We booked a double room but when we arrived they told us one bed was only available. We didn’t like that because we had already paid for a double. I’m glad I was traveling with my best friend and not someone I didn’t mind sharing a bed with. I don’t think it was fair of the hotel to not provide us what we asked for. Like I said before what if I was traveling with someone that I really didn’t feel comfortable with sharing a bed. It would have been very odd. And did I receive a room that was better or no. I would never know. Staff are AMAZING!!!! Honestly the best hotel I’ve ever stayed in! We were completely blown away by the service at Rocabella Mykonos. The hotel is beautiful and in an absolutely stunning location. Every single member of staff was warm, friendly, positive and went out of their way to assist us. 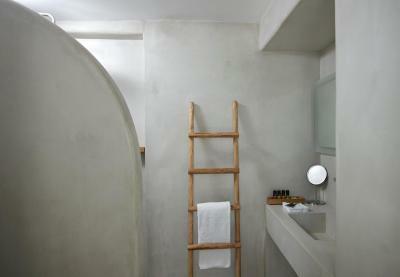 The room was minimalist, stylish and very comfortable. The food in the restaurant was excellent. Breakfast was delicious and fresh, the lunch menu is simple and really tasty. We ate dinner at the restaurant one night and it was spectacular – although a little more fancy than we would have preferred. We had a massage at the spa one day and it was excellent. The masseuse was professional and the whole experience was really very good. I was 28 weeks pregnant at the time and I had a small complication with the pregnancy. I messaged my doctor back home who advised me that I needed to get it checked out. The staff at Rocabella were incredible – they snapped into action to get me to the clinic quickly and they were all incredibly concerned and accommodating (thankfully everything was fine). We found the nearby beach a little busy, but the amazing reception team recommended an alterantive and organised transport – they also booked us sunbeds in advance – it was very special. Everything about Rocabella is easy and relaxing – you don’t need a car because the hotel will help you get to wherever you need to go – and they have a great system for communicating with them while on the island. I would highly recommend it.